DO-17090-04 was succesfully added to your cart. Calibrations on clamp meters are performed using high-accuracy multi-function calibrators and standards-grade reference multimeters per manufacturer’s recommended procedures. Ten- and 50-turn coils are used to achieve measurements up to 1000 Amps. Does this calibration cover all functions of a clamp multimeter(AC/DC Current, AC/DC Voltage, Resistance), or just the clamp function? This NIST-calibration will only cover the current clamp meter. 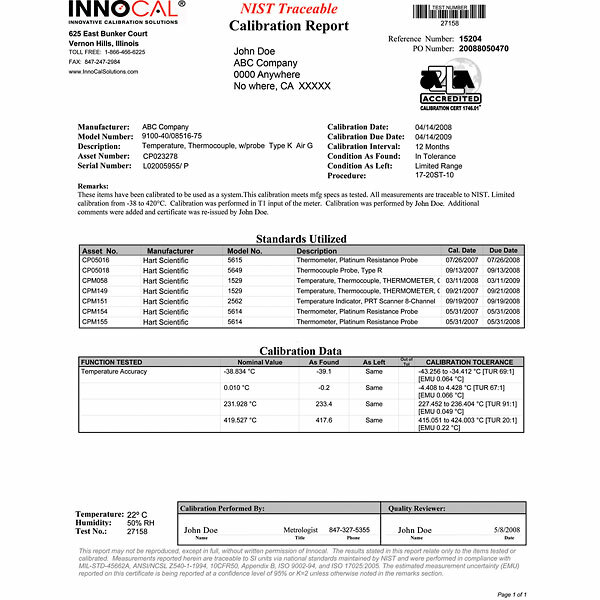 Please see part# 17090-00 for the calibration associated with a 4.5 digit handheld multimeter. This is not a piece of equipment. This part number is for the NIST certification of a clamp-on Volt/Ohm meter. We have a large selection of these meters to choose from and you would purchase a meter if you needed NIST certification you would also order this part number.